On 19 June, the Yabloko party launched protest actions against a pension reform proposed by the government and envisaging raising of the retirement age. 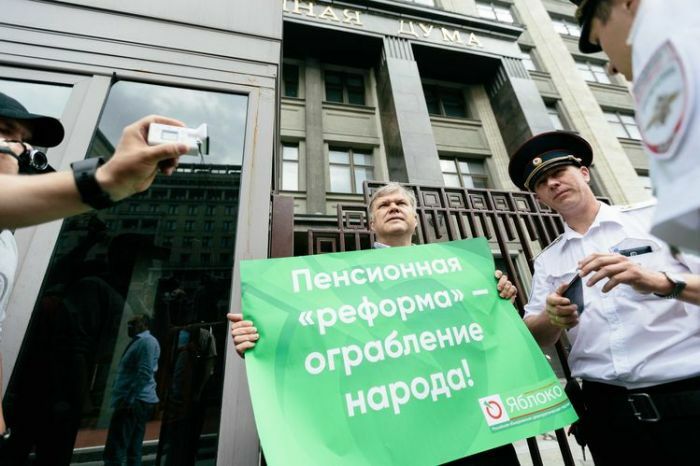 Members of the Moscow branch of Yabloko conducted a series of single-person pickets (which do not require any permission for the authorities), alternately holding a poster running “The “pension reform” is a robbery of the people!” The action was held at the entrance to the State Duma building in the morning. However, the action lasted only 15 minutes. Police officers arrested Sergei Mitorkhin, leader of the Moscow Yabloko. The police referred to the order of Vladimir Putin, which prohibits any protest actions, including single-person pickets, during the World Cup. 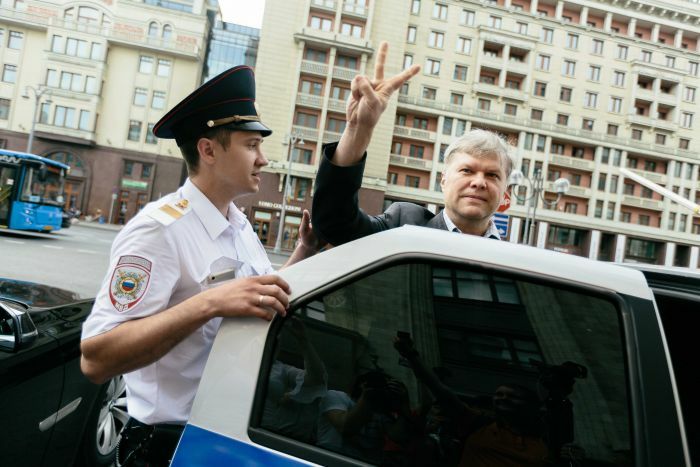 Sergei Mitrokhin was taken to the Tverskoye police station. We should note that Yabloko is the first political party that held a street protest action against raising the retirement age. According to Mitrokhin, only preventive protest actions can force the government and parliamentarians to reconsider their plans for reforming the pension system. He announced the next action. It will be a rally that has to be held in Suvorov Square in Moscow on 3 July, and called on citizens to show civic activity, since the government’s initiative concerns every citizen of the country. In addition, on 1 July, the Sverdlovsk branch of Yabloko plans to hold a rally against raising the retirement age in the centre of Yekaterinburg. The notification of the action has already been sent to the Ministry of Public Security of the region. Also the regional branch of Yabloko will begin collecting signatures of citizens against the initiative of the government in the party office. UPD: After drawing up the protocol of detention, Sergei Mitrokhin was released from the police station. On 5 July, his case will be examined by Tverskoi District Court of Moscow. 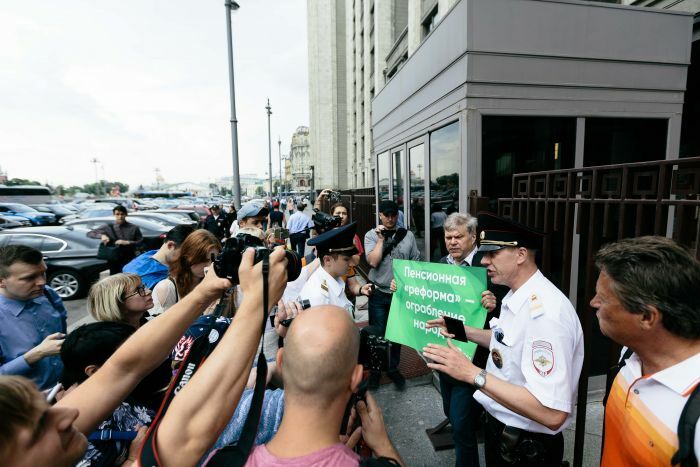 Mitrokhin is charged with Article 20.2 of Part 8 of the Administrative Violations Code (repeated violation of the procedure for holding a picket). He is facing of up to 30 days of arrest.